Three rights groups, Niger Delta Security Watch of Nigeria, NDSWN, Ijaw Peoples Development Initiative, IPDI, and Foundation for Human Rights and Anti-Corruption Crusade, FHRAAC, have on Thursday, called disagreed with the leader of the Indigenous People of Biafra, IPOB, Nnamdi Kanu, over his recent declaration that former President, Dr. Goodluck Jonathan, was incompetent and naive. 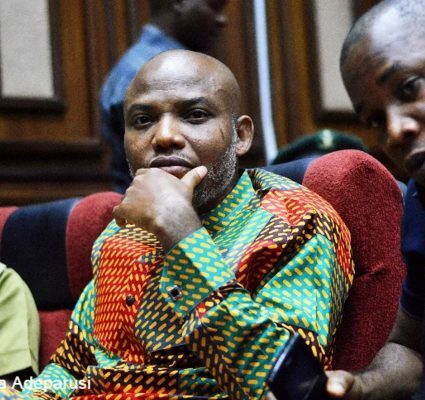 The groups led by Dickson Bekederemo, Austin Ozobo and Alaowei Cleric, cautioned Kanu to be mindful of his choice of words in public in order not to be misconstrued. They said, “Why we want to totally disagree with Nnamdi Kanu is that due to the inordinate ambitious northern elite, no matter one’s selfless sacrifice to assuage their yearning, as long as political power is not in their hands, they will still hate the south. “President Jonathan was neither ignorant, nor naive, but was caged nor he spent his tenure placating a region that see power as their birth right. The Arewa Consultative Forum love and adopt any southerner as their son if the southerner is a willing tool against his own people. “While we are in agreement with Kanu on the issue of the north hating the south, we however, take exception to his assertion that President Jonathan was incompetent. “What does Nnamdi Kanu want from GEJ? That GEJ should have ruled with brute force like President Buhari? Or that he should have concentrated his developmental efforts only in the south as a result of their hate for the south? “While we appreciate Kanu’s disposition towards northern political elite with born to rule attitude, we want to say here that hate for hate multiply hate. We are all witness to the 95 per cent and 5 per cent dichotomy introduced by President Buhari into our democratic lexicon, which has snowballed into irreconcilable misunderstanding between the north and south. ” At the moment, President Buhari hatred for south which he demonstrated through his lopsided appointment has taken Nigeria to the cliff and the only remedy for the country not to fall over the cliff is the immediate implementation of confab report of 2014. “We expected Kanu to equally appreciate the contributions of Niger Delta towards his release and the Biafra agitation as counterparts. We never expected of him to make outbursts that will undermine the friendship of the east and Niger Delta region. “Again ,despite there were some shortcomings in Jonathan government, it is wrong to say Jonathan was not friendly to the east, or ignorant and naive, there was no average politician in the east that did not benefit from Jonathan administration.